Médecins Sans Frontières (MSF) helps patients in Ukraine navigate the difficulties of treatment for drug-resistant tuberculosis. This story originally appeared on MSF's Exposure page. In a forest on the outskirts of Zhytomyr city in northwestern Ukraine stand the solid brick buildings of the regional tuberculosis (TB) hospital. While most countries have moved to a model of treatment for TB centred on outpatient care, TB patients in Ukraine still spend months, and sometimes years, confined to isolated hospitals such as this one. The treatment for TB – and particularly for drug-resistant forms of the disease – is not easy, often requiring daily injections and a cocktail of drugs that can cause side effects like nausea, itching, fatigue, irreversible deafness and even psychosis. A Ministry of Health nurse distributing pills to the patients in the multidrug-resistant TB (MDR-TB) ward of the Zhytomyr Regional TB Dispensary in Zhytomyr, Ukraine. Photograph by Oksana Parafeniuk. At Zhytomyr regional TB hospital, there is little to distract patients from the difficulties of their treatment – funding shortages have seen the library shut down and the television removed. Many patients find the long, harsh winters, when they must remain inside, especially difficult to cope with. The side effects of the drugs, the monotony of hospital life and being separated from their family and friends for months on end can leave them feeling depressed and hopeless; as a result, some patients check themselves out of the hospital before their treatment is complete. Patients at the Zhytomyr regional TB hospital gaze outside. Photographs by Oksana Parafeniuk. Incomplete TB treatment is a major concern, as it can lead to the development of drug-resistance. Ukraine is one of the top 20 countries in the world with a high burden of drug-resistant TB (DR-TB), according to the World Health Organization (WHO). In Ukraine, DR-TB accounts for over a quarter of new TB cases and almost a half of previously treated cases. Drug-resistant cases are especially difficult to cure, with a treatment success rate in Ukraine of just over 50 per cent. Each day MSF's staff works side-by-side with local nurses, doctors and pharmacists to deliver effective treatment to patients with DR-TB in Zhytomyr. Photographs by Oksana Parafeniuk. In 2018, in partnership with the regional TB hospital, Médecins Sans Frontières (MSF) launched a pilot project to improve the treatment of DR-TB in Zhytomyr based on the latest international recommendations. The programme focuses on offering patients more manageable and effective treatment options, including a shorter treatment plan lasting nine to 12 months (as opposed to the standard 20 to 24 months) and new highly effective oral TB drugs, which cause less severe side effects than the older injectable drugs. MSF is also working with local healthcare providers so that patients can move to outpatient, home-based care as soon as they are ready. Through counselling and education, MSF's mental health team assists patients with the challenges they face, both inside and outside the hospital, to ensure that they complete their treatment successfully. MSF psychologist Volodymyr Lychagin conducts a therapy session with TB patient Ihor, 40, outside the hospital. Photographs by Oksana Parafeniuk. Heidi Niehus, nurse team supervisor, counselling multidrug-resistant TB (MDR-TB) patient Halyna Uvarenko. Photograph by Oksana Parafeniuk. 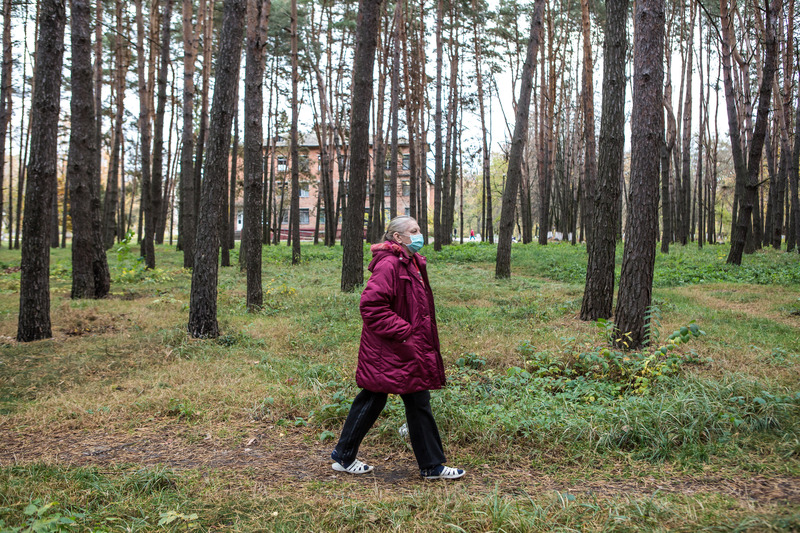 Halyna, 56, is on the shorter nine to 12 month treatment for multidrug-resistant TB (MDR-TB) offered by MSF. Initially Halyna was receiving injectable drugs, but after experiencing severe side effects, her prescription was changed, and she is now progressing well with her treatment. Halyna’s husband, who also had TB, died recently, and when Halyna is discharged from the TB hospital to start outpatient care she will live on her own. MSF’s mental health team took Halyna to visit her village for the first time since her husband’s death in order to prepare her for any challenges she might face after discharge. Halyna says that after seeing what her husband went through, she understands the importance of completing her treatment, no matter how hard it can get. Halyna takes her daily medication and goes for a walk around the grounds of the hospital. Photographs by Oksana Parafeniuk. Oksana Kolodiuk, 39, and Nataliia Klymyk, 44, both have extensively drug-resistant tuberculosis (XDR-TB). Here they are sitting on their beds in the room they share at the Zhytomyr Regional TB Dispensary. Photograph by Oksana Parafeniuk. Oksana, 39, and Natalyia, 44, share a room. Oksana was diagnosed with extensively drug-resistant TB (XDR-TB) in August 2018, but until recently, the drugs to treat XDR-TB were simply not available in Ukraine. Oksana Kolodiuk, 39, a patient with extensively drug-resistant tuberculosis (XDR-TB) sits on her bed at the Zhytomyr Regional TB Dispensary. Photograph by Oksana Parafeniuk. Oksana (left) and Nataliya (right) talk with MSF staff members in their shared room at the regional TB hospital. Oksana tries to stay busy by embroidering and knitting. Photographs by Oksana Parafeniuk. For Nataliya, the search for a cure has taken much longer. Nataliya was diagnosed with TB in 2016. During her initial treatment, she developed a severe allergy to the medications. To make things worse, after nearly two years of treatment (including a nine-month stay in the TB hospital) Nataliya learned that her TB was still not cured because the drugs she was taking were not effective against XDR-TB. Thanks to the MSF programme, she is finally receiving treatment with new drugs and is preparing to start outpatient care. Nataliia Klymyk, 44, has extensively drug-resistant TB (XDR-TB). Here she is pictured sitting on her bed at the Zhytomyr Regional TB Dispensary. Nataliia was first diagnosed with TB in 2016. Photograph by Oksana Parafeniuk. What are the next steps for DR-TB treatment in Ukraine? In December 2018, the WHO announced new recommendations for the treatment of MDR-TB. According to the announcement, fully oral treatments should become the preferred medication option for most patients, and injectable agents are no longer among the priority medicines to be considered when designing longer treatments for MDR-TB. 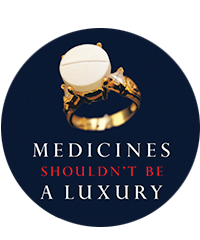 In particular, kanamycin and capreomycin—drugs known to cause deafness and other severe side effects—are no longer recommended; whereas, the use of newer, more potent drugs—such as bedaquiline—is strongly recommended for all adult MDR-TB patients. The WHO first recommended use of bedaquiline for treatment of drug-resistant TB in 2013. However, uptake of bedaquiline and other new TB drugs (such as delamanid) remains very slow, with the medicines remaining inaccessible to almost 90 per cent of people worldwide who could have benefitted from them in 2017. In Ukraine, bedaquiline was registered in June 2018, while registration of delamanid is still to be finalised. MSF has been outspoken about the importance of increasing access to these drugs and was one of the first to offer them to patients in Ukraine. Following the new WHO recommendations, in 2019, all new patients in the MSF pilot project in Zhytomyr will only be prescribed oral TB drugs, and MSF hopes to see these guidelines become the standard countrywide as soon as possible. (Left) MSF nurse Olena Markova conducts a test to see if TB patient Lidiia, 78, has hearing loss due to her treatment. (Right) A tray of medications is prepared for the daily rounds at the TB hospital. MSF is also helping to upgrade and renovate the TB laboratory system in Zhytomyr according to international standards. Modern biochemistry equipment has been donated to the existing laboratory at the regional TB hospital, and MSF’s international experts are currently training and monitoring hospital staff in the use of the equipment. MSF will also build a new Biosafety Level 3 laboratory within the hospital by the end of 2019. The new laboratory will be the first in Zhytomyr region able to test quickly for various types of TB drug resistance using Line Probe Assay (LPA) rapid diagnostics. Currently only four other laboratories in Ukraine have LPA diagnostics, and none are able to test patients from Zhytomyr region due to geographical and logistical constrains. Bringing the laboratory up to international biosafety standards will safeguard laboratory staff in Zhytomyr and make the new laboratory one of the top in the country. Laboratory staff at the regional TB hospital in Zhytomyr handle patient samples. Photograph by Oksana Parafeniuk. MSF first began work in Ukraine in 1999. In addition to providing treatment for DR-TB in Zhytomyr region, MSF currently has a treatment programme for hepatitis C in Mykolaiv. MSF teams are also working in eastern Ukraine running mobile clinics, which provide medical and psychological support to the people affected by the ongoing conflict. MSF is an international medical humanitarian organisation working under the principles of neutrality, independence and impartiality in more than 70 countries around the world. MSF does not take sides in any conflict, is independent of all political, military and corporate agendas, and provides medical care to people on the basis of need alone, irrespective of gender, race, religion or political affiliation. MSF’s medical teams are focused solely on responding to medical humanitarian needs. In Ukraine, we receive no funding from any government, all of our activities are funded by private individuals. Internationally, over 95 per cent of MSF’s funding is from private donors.